The first step to delicious, healthy sour dough bread is the, aptly named, Starter! 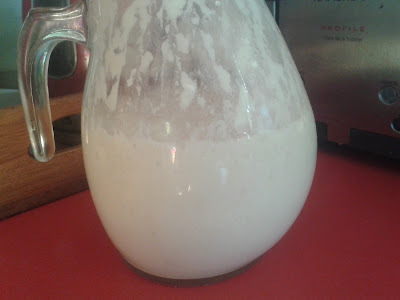 Now, making a sour dough starter is a process of fermentation and growing your own yeasts (as opposed to buying yeasty critters from the supermarket). It takes a few days to get going and I find it easier to think of the instructions in terms of days rather than hours. You'll be making bread on day 6, by which time, I'll have instructions for sour dough bread up for you, too! Get a suitable container. 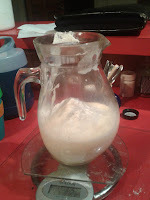 I've used a glass jug here, so you can see the bubbles, but a 2L plastic icecream container is fine. You want to be able to cover it, but not seal it, so if you use a plastic container, just sit the lid on top, instead of sealing. Into the container, place 5 tablespoons of unsweetened yoghurt and 175 ml of warm milk. Cover (but don't seal) and leave for 24 hours (I just pop it in the kitchen pantry - just somewhere that's room temperature). Day 6: Ready to use for bread! Any day that you don't make bread, treat the starter as per Day 5 above: remove half and feed with flour and water. With time and practice, you become familiar with the amounts will not need to worry about measuring and weighing. The starter responds to heat and cold and you can use these to your advantage. Your starter will work more quickly if it is warm, but I find this provides a more sour taste than we like. So, in hot weather I put the starter in the fridge during the day and in the pantry at night. In winter the starter just lives in the pantry. 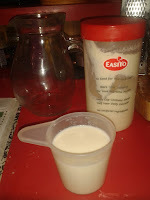 If you are going away and won't be around to feed your starter, pop it in the fridge for up to a week. 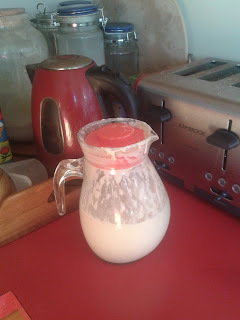 If your starter has been in the fridge, leave it out at room temperature until it looks bubbly again before you use it. You'll find that over time old starter builds up around the top of your container, every now and then swap the starter into a new container and wash the old one. Happy Sour Dough Adventures, People!